At an event in Shanghai, China, smart device maker Oppo launched a couple of Reno Edition smartphones. The signature feature of the Reno design is a 'shark's fin' style pop-up selfie camera, facilitating an all-screen front with minimum bezels and no notches or cutouts. The Chinese audience were shown the Reno Standard and Reno 10x Zoom. At a slightly later event in Zurich, Switzerland, the Reno 5G was launched too. The best device revealed in China yesterday was the Reno 10x Zoom Edition. This smartphone is based around a 6.6-inch, 2340 x 1080 pixel AMOLED display, with a Qualcomm Snapdragon 855 processor inside with Adreno 640 GPU, 6GB to 8GB of RAM, 128GB to 256GB of UFS 2.1 storage (plus microSD card), and a 4,065mAh VOOC 3.0 fast-charging battery. Other features include an NFC chip, optical in-display fingerprint reader, Dolby Atmos and Dolby AC-4 audio, Hi-Res Audio support, and triple microphones. Moving onto the cameras in the Reno 10x Zoom, it boasts a 13MP f/3.0 periscopic zoom camera with OIS. It is accompanied by an 8MP f/2.2 super wide camera (120 degrees) and a 48MP f/1.7 main camera with OIS (using the Sony IMX586 sensor). In total the camera array offers focal lengths covering a 10x zoom range, from 16-160mm. 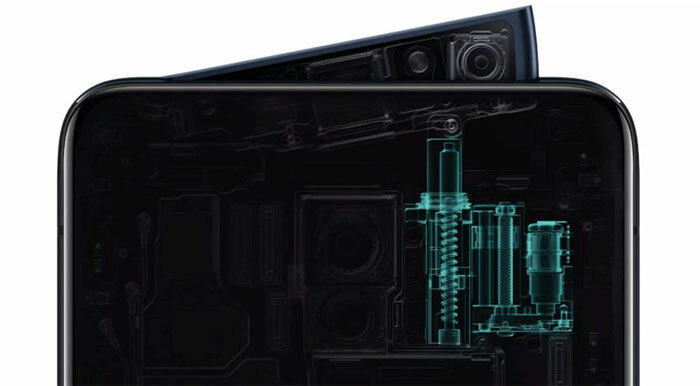 The shark's fin pop-up comes packing your selfie camera which is a 16MP f/2.0 unit accompanied by a soft flash. The fin also provides a flash to the rear facing cameras. If you are concerned about wearing out the shark's fin mechanism, this motorised part is said to be good for five years with 100 cycles per day (over 180,000 operations). A fall detection feature will trigger the fin to retract for self-protection, in case of such an accident. 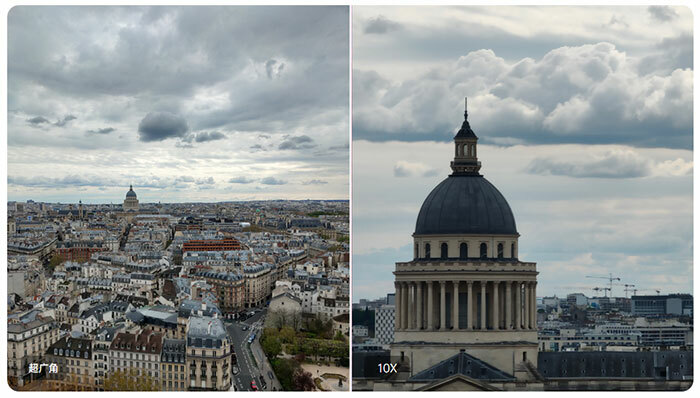 The Reno 10x Zoom isn't very light or thin at 210g and 9.3mm. Oppo's Reno Standard Edition is subject to a number of spec cuts. Firstly the screen is smaller, (6.4-inches) but features the same resolution and is still an AMOLED screen with under-display fingerprint sensor. Inside you will find a lower-end chipset, the Snapdragon 710 with Adreno 616 graphics. Like its big brother it comes with a choice of 6GB or 8GB of RAM, and 128GB or 256GB of onboard UFS 2.1 storage but there is no microSD card expansion available in this model. Reno Standard cameras include the same selfie camera as in the 10x Zoom model, above. However, round the back there is no periscopic zoom, just a 48-megapixel main camera (without OIS), and a 5-megapixel depth camera to enable bokeh effects and so on. The Reno Standard Edition has a smaller battery too, at 3,765mAh. Overall it is a lighter and thinner package at 185g and 9mm. Lastly, the Reno 5G appears to be a Snapdragon X50 modem packing variant of the Reno 10x Zoom. It was launched in Switzerland to please 5G network partner Swisscom. An early hands-on with the device by Pocket Lint showed that Oppo's first 5G smartphone could be used to download files at about 1.3 to 1.5Gbps. Swisscom said that maximum throughput could be a bit higher than this, at approx 1.86Gbps. 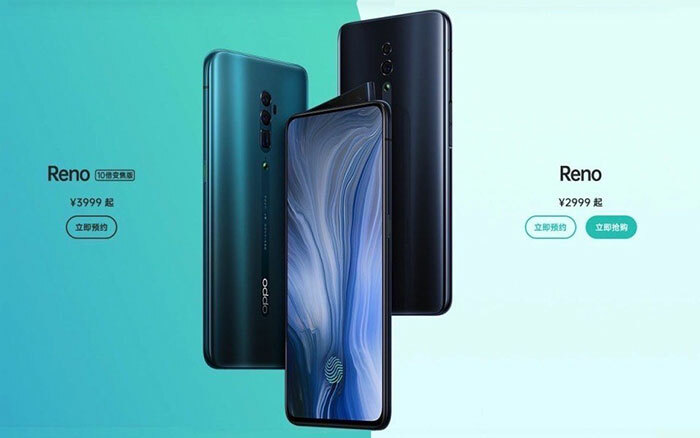 With regard to pricing and availability, the Oppo Reno Standard will be priced from 2,999 yuan (£340) and availability starts from 19th May. The Reno 10x Zoom will start at 3,999 yuan (£450), and become available around the same time. Lastly, the Oppo Reno 5G has been advertised starting at 999 Swiss Francs (£760), again with a May release scheduled.